I recently upgraded to OS.X Yosemite and am getting back to iOS development. I now can't find the iOS Simulator option in AppCode 3 when I want to debug an app. The popup menu in the header bar only shows the hardware configs that, I assume, are supported by XCode 6. I did try pointing AppCode at XCode 5. I see a different set of hardware configs but still don't see the iOS Simulator option. Is this an OS.X Yosemite problem? I installed Java 8 in order to run AppCode. Perhaps that's the issue? I'm downloading Java 6, just to make sure the Java version isn't the issue. 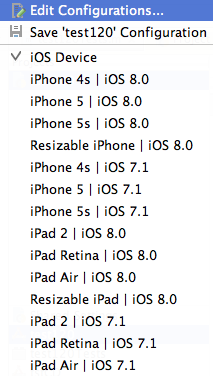 the names of simulators have changed in Xcode 6, we're going to support them in the next AppCode build. Cool! I really love using AppCode (and Intellij IDEA, I might add.) I'll keep an eye out for the release. Will this be an EAP release or a dot release of the current versreion? Does the 3.0.1 release have the new simulator names? I did download and try it but I still don't see any simulator options when using Xcode 6. I'll keep experimenting. Thanks much, working for me now. Copyright © 2000– JetBrains s.r.o.